(PR) (Trenton, NJ) – A night after scoring a season-high 17 runs, the Trenton Thunder (57-51) were shutout by Clayton Tanner and the Richmond Flying Squirrels (60-47) 5-0 on Sunday afternoon at Waterfront Park. The Thunder offense was held to just four hits and never advanced a runner to third base. Flying Squirrel starter Clayton Tanner hurled eight shutout innings to lead the Flying Squirrels, who won three of four games in the series, to the series win. Steve Garrison, who made his Major League debut on Monday, returned to his hometown team to make his eleventh start of the season. On a limited pitch count, the lefty only lasted three innings and allowed three runs in the loss. The Squirrels scored one run in each of the first four frames to take a commanding lead that was never in jeopardy on Sunday afternoon. In the final game that the two teams will play this season, Richmond finishes the season series winning ten of fifteen games against the Thunder. After an off day on Monday, the Thunder will welcome the Akron Aeros to Trenton for the first time this season. Game one of a three-game set with the Double A Affiliates of the Cleveland Indians begins Tuesday night at 7:05 PM. The Thunder and the Aeros have not officially named starting pitchers for Tuesday’s game. The SBLI Pre-Game Show with Jay Burnham and Hank Fuerst begins at 6:45 PM. Tune-in to the game on 91.3 WTSR and online at trentonthunder.com. Tuesday night is Farmer Appreciation Night presented by the New Jersey Farm Bureau. The first 1,000 fans ages 18 and older will received BBQ Mits, once again courtesy of the New Jersey Farm Bureau. Tuesday is also a Super Value Tuesday, featuring $1 Hot Dogs and Kids Eat Free Courtesy of On The Border. For ticket information, contact the Thunder Ticket Office at 609-394-3300 or log on to trentonthunder.com. 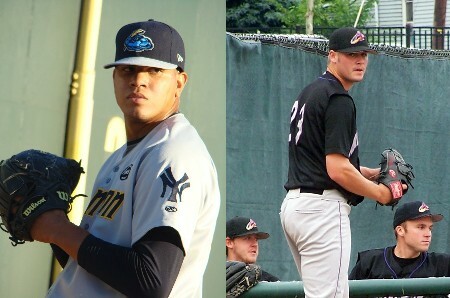 (Trenton, NJ) – The Trenton Thunder, Double-A Affiliate of the New York Yankees, announce that LHP Steve Garrison has been received from the New York Yankees. In a corresponding move, LHP Brad Halsey has been transferred to Advanced A Tampa. The moves leave the Thunder 24-man active roster at its maximum capacity. Garrison, a native of Ewing, New Jersey, was promoted to the Yankees eleven days ago and made his Major League debut on Monday, hurling the final two outs in a Yankees win over the Seattle Mariners at Yankee Stadium. On the season, Garrison is 3-6 with a 6.36 in ten starts and one relief appearance with the Thunder. The Thunder will conclude their four-game set with the Richmond Flying Squirrels at Waterfront Park on Sunday at 1:05 PM. Trenton will give the pearl to LHP Steve Garrison (3-6, 6.26), while the Squirrels will counter with LHP Clayton Tanner (3-8, 4.50). The SBLI Pre-Game Show with Jay Burnham and Hank Fuerst begins at 12:45 PM. Tune-in to the game on 91.3 WTSR and online at trentonthunder.com. The first 1,000 fans ages five to 15 to Sunday’s Healthfirst New Jersey Kids’ Club game will receive Thunder Growth Charts presented by Allstate Insurance. For ticket information, contact the Thunder Ticket Office at 609-394-3300 or log on to trentonthunder.com. (PR) (Trenton, NJ) – The Trenton Thunder (57-50) used a near record-setting offensive explosion in a 17-5 drubbing of the Richmond Flying Squirrels (59-48) in front of 7,511 fans on Saturday night at Waterfront Park. In game three of the four-game set, Yadil Mujica and Addison Maruszak each drove in four runs and Zoilo Almonte had four hits to lead the Thunder to their first win over the Squirrels in the last nine tries. Thunder starter Shaeffer Hall hurled seven innings to extend his team-lead in wins to ten.For the third straight night, the Thunder took the lead in the first inning. Just two batters into the game, Corban Joseph doubled to the right-centerfield gap to score Ray Kruml, who had walked and had stolen second base. After two more walks and two strikeouts, Jose Gil walked with the bases loaded to give Trenton a 2-0 lead. After Richmond’s starter Ryan Verdugo left the game, Yadil Mujica singled down the line in left to score two runs and put his squad ahead 4-0. Richmond briefly tied the score at 4-4 with a four-run performance in the top of the third, and the Squirrels appeared to be right back in the ball game. That notion was short-lived as the Thunder immediately added five runs in the bottom of the third inning to take a 9-4 advantage. Yadil Mujica knocked another two-run single, and Addison Maruszak hit his sixth homerun of the season, a three-run shot. The Thunder brought nine men to the plate in the third, equaling the total brought to the dish in the first inning. From that point forward, the Thunder tacked-on eight straight runs to easily win the game 17-5. The 17 runs mark the most scored in a game for Trenton this season, breaking the previous total of 13 that were scored in the last win at home on July 20. In the team’s eight innings at the plate, the Thunder scored at least one run in six of them. The seventeen runs also fall just three shy of the most scored in a game for the Thunder in franchise history. Five Thunder runs would have stood as plenty on Saturday night as Shaeffer Hall won his fourth straight game. Other than Richmond’s four-run, five hit third inning, Hall did not allow a hit and faced the minimum in six other innings. Hall’s tenth win increases his team-lead and brings him to second place in the Eastern League. (PR) (Trenton, NJ) – After a two-hour and eleven minute rain delay, the Richmond Flying Squirrels (59-47) used a late homerun from Chris Dominguez to beat the Trenton Thunder (56-50) 3-2 in front of 6,980 fans at Waterfront Park on Friday night. Austin Romine had three hits and an RBI for Trenton on another quiet night for the team’s offense. The win for the Flying Squirrels marks the eighth straight time that the team has beaten the Thunder.For the second straight night, the Thunder scored a run in the bottom of the first inning to take an early 1-0 lead. Against the tough Eric Surkamp, who occupies the lowest ERA in the Eastern League (2.05), Austin Romine drove in Ray Kruml from third base on a one-out infield single to shortstop. After Richmond scored twice in the top of the fifth, the Thunder immediately answered with a run to tie the score at 2-2. With two outs, Ray Kruml singled through the middle to keep the inning alive for Trenton. A batter later, Corban Joseph laced a double into the right-centerfield gap to score Kruml from first to tie the ball game. A long solo homerun from Chris Dominguez in the top of the eighth inning gave the Flying Squirrels just enough to win on Saturday. The Thunder bats were held in check by the Richmond pitching staff for the majority of the night. The Squirrels’ starter Surkamp dominated Trenton’s offense to the tune of two runs on six hits and twelve punch-outs in six innings. Solid pitching has led Richmond to wins in each of the first two games in this series, surrendering a combined five runs. The Thunder will resume their four-game set with the Richmond Flying Squirrels at Waterfront Park on Saturday night at 7:05 PM. Trenton will give the pearl to LHP Shaeffer Hall (9-4, 4.07), while the Squirrels will counter with LHP Ryan Verdugo (7-4, 3.75). The SBLI Pre-Game Show with Jay Burnham and Hank Fuerst begins at 6:45 PM. Tune-in to the game on 91.3 WTSR and online at trentonthunder.com. Fans with tickets to the July 29 game may exchange them for tickets of equal or lesser value to another 2011 Thunder regular season home game except August 25, subject to availability. Ticket stubs must be presented in person at the Thunder Ticket Office at Waterfront Park. This exchange is valid for all July 29 tickets whether they were used or not. Suite level and picnic tickets may be exchanged for pavilion or club level seats based on availability. The Thunder invite you to Waterfront Park for a jam-packed Saturday afternoon and evening of events at Waterfront Park. Starting at 2:00 PM, the Community Blood Council of New Jersey will be holding a blood drive. Then, a Thunder Dance Team performance and Fireworks will immediately follow Faith Night at the ballpark. For ticket information, contact the Thunder Ticket Office at 609-394-3300 or log on to trentonthunder.com. I’ll be here until 10:45 PM…I’ll update y’all the best I can until then. — Stoneburner sitting 88-89 MPH with the fastball, touching 90 MPH in the first inning. Hideki Irabu, who pitched for the Yankees from 1997-99 and was one of the first of a wave of Japanese players to come to the big leagues, was found dead in his California home on Wednesday. He was 42 years old. The death is believed to be a suicide. Current Trenton Thunder pitcher Kei Igawa, who played with Irabu with the Hanshin Tigers in 2003, was saddened when he found out about his teammate’s passing. “I was very surprised when I heard about it,” said Igawa through interpreter Subaru Takeshita. The parallels between Irabu and Igawa are somewhat striking. Both acquired in big money deals after starring in their homeland, both disappointed under the bright lights. Irabu, who also pitched for the Expos and Rangers after being dealt out of the Bronx, made 74 appearances for the Yankees. Despite a 29-20 record, he posted a 4.80 ERA and was unsuccessful in his lone postseason start in the 1999 ALCS against the Boston Red Sox. He made just 16 big league appearances before being buried in the minors after being unwilling to accept a return to Japan, as Irabu eventually had. But before each man initially left Japan, big things were expected from both. And even upon Irabu’s return, he held hero status in his homeland. “Obviously, when he first came to the big leagues, he held a lot of records and titles,” Igawa said. Igawa, who is known to be somewhat reclusive and mysterious, says he did not remain in touch with Irabu once he retired for the first time following the 2003 season. Irabu did return briefly to pitch in the Golden Baseball League three seasons ago. 8:00 PM — Tarp on, tarp off, tarp on…such is life here in Trenton. 6:05 PM — Steve Garrison isn’t in Trenton…yet. Tony Franklin isn’t sure, but thinks that Garrison would likely return to the rotation upon his arrival. I disagree, for what it’s worth. The Thunder have a full rotation and if you’re going to use Garrison as a reliever in the big leagues, why not use him that way here as well. It isn’t like you’re breaking up a line of success he was having here…Garrison struggled to an ERA over six as a starter. DeAngelo Mack, while active, is not playing for the second day in a row. Ryan Baker, as expected, was placed on the DL to make room for Graham Stoneburner. Stoneburner expects to throw his normal amount of pitches this evening. 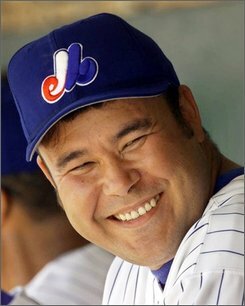 Also, I spoke to Kei Igawa to get his reaction on the passing of Hideki Irabu…stay tuned. 4:15 PM — Also, just to do some housekeeping…Grant Duff will miss the rest of the season due to a shoulder issue. I initially just said he’d miss the rest of the year yesterday. 4:05 PM — Scott Stanchak, reporting from Yankee Stadium for the Democrat today, reports that Joe Girardi said Steve Garrison is coming back to Trenton. 4:00 PM — (PR) The stars and stripes jersey that the Thunder wore on July 3 has had its share of controversy. Both Yahoo Sports and the New York Daily News called it the ugliest jersey in sports, Brian Cashman joked about it to Yankees players and Derek Jeter said he was uncomfortable wearing it. We actually thought they were pretty cool and fitting for our Independence Day game, but hey, you can’t please everyone. The jerseys worn on the field that day by the Trenton Thunder players are up for auction on the team’s new auction website. Bidding starts at 10:00 am on Friday, July 29 and runs until August 8 at 11:59pm. Whether you were at the stadium for this record-setting game or not, don’t miss this opportunity to own a piece of Trenton Thunder history! 3:50 PM — This is the “here’s what Dellin Betances and Tony Franklin said last night” version of the notes since I passed out when I got home. (PR) (TRENTON, NJ) Fans of Trenton Thunder, Double A Affiliate of the New York Yankees, will see a lot of familiar scenes in the new documentary Derek Jeter 3K which premiered on Thursday, July 28 on HBO. HBO’s award-winning documentary team chronicled Derek Jeter’s quest for 3,000 hits with Jeter allowing unprecedented access to the filmmakers, including capturing his interactions with teammates, family and friends. The production crew was with Jeter throughout his two game rehabiliation assignment in Trenton on July 2 and 3 when he stood just six hits away from the historic milestone. Trenton Thunder radio broadcasters Jay Burnham and Hank Fuerst and Manager Tony Franklin are featured prominently and scenes from around Mercer County Waterfront Park dominate the segment. Approximately five minutes of the hour long documentary are focused on Jeter’s time in Trenton. The documentary, which was produced by MLB productions, is currently scheduled to air daily on HBO East, HBO West, HBO Latino East and HBO Latino West until August 11. We spoke to Corban Joseph and Manny Banuelos about trade deadline stuff…stay tuned for that. Also, Graham Stoneburner starts tomorrow. They’ll need to make a move to get him on the roster. As far as sports days go in Trenton, this should be one of the more intriguing ones. The capital city welcomes back their beloved hockey franchise in the afternoon, and…while not one of the best, one of the more interesting pitching matchups takes place at Waterfront Park later tonight. This is, after all, a baseball blog…so let’s start with that first. On your left is Dellin Betances. On your right? Chuck Lofgren. One is widely regarded as one of the top pitching prospects in baseball. And, at one time, so was the other. 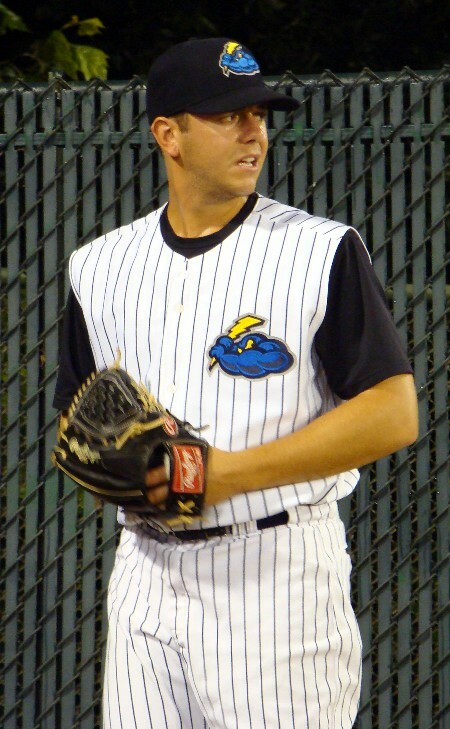 Lofgren, who takes the ball today for the Richmond Flying Squirrels, was twice ranked as the second best prospect in the Cleveland Indians system by Baseball America (2007 and 2008). His breakout 2006 season (17-5, 2.32 ERA in High-A Kinston) led to the-then 20-year-old being considered by some to be one of the top 50 prospects in all of baseball. “He emerged as one of the top lefthanders in the minors in 2006,” reads the 2007 Baseball America Prospect Handbook. “He could make his big league debut later in the year,” says the 2008 edition of the book. Just don’t look for him in the 2009 printing. Lofgren, now 25, essentially fell off the prospect map two years ago, largely in part to a disastrous 2008 campaign that saw him go 2-6 with a 5.99 ERA in 28 appearances — just 15 of them starts after getting yanked out of the rotation. The following year wasn’t much better, as he tallied a 5.31 ERA in 17 starts at Triple-A Columbus inbetween successful stints in Akron. Just a year removed from being considered one of their top prospects, the Indians gave up on Lofgren, choosing not to protect him in the 2009 Rule 5 draft. The Brewers drafted him, and eventually worked out a trade with Cleveland after he failed to make their big league team. One season that yielded a 7-8 record and 5.19 ERA in 28 Triple-A appearances later, and Lofgren’s time in Milwaukee was over as well. Now, the southpaw finds himself in his third organization in as many seasons, pitching in Double-A with the San Francisco Giants. And the Futures Game alum (’07) will be making just his second appearance at that level this season, unfathomably stuck at High-A San Jose for most of the year. He pitched in 18 games there — making just two starts — and did well, holding opponents to a .198 average against while posting 2-0 record and 3.68 ERA. Lofgren has one Double-A start under his belt this season, a successful outing against Harrisburg on July 23 in which he went 5 2/3 innings and allowed just one run on three hits, picking up the victory. And even with all that, there will unquestionably be more interest on the guy who toes the rubber for the other team tonight. The quickest way to figure that out would be to look behind home plate, where a likely larger than normal amount of scouts radar guns are pointed towards Dellin Betances. Betances, a big 23-year-old righty, has been the subject of trade rumors for nearly as long as he’s been with the Yankees. Rated as the system’s third best prospect by Baseball America, and arguably a number one in many organizations, it wouldn’t be a stretch of the imagination to say that this very well could be the final start he makes under the Bronx Bombers umbrella. The hard throwing Bronx-born Betances made great strides last season, with his 8-1 record in Tampa (complete with 1.77 ERA, 88/19 K:BB ratio and .169 average against) essentially proving he was healthy after struggles in that regard in previous years. While pitch efficiency has been a concern for both he and fellow top-rated starter Manny Banuelos all season long — Betances has mindbogglingly averaged less than five innings per start this season — the numbers don’t lie. In 17 starts, Betances has held the opposition to a .199 average against and struck out 95 Eastern League batters in 84 1/3 innings of work. And despite the value he clearly carries to his own organization, he’s an extremely hot commodity to others as well. You can’t help but wonder if this will be one of those crazy days that remind you of 2008, in which Phil Coke got pulled one inning into his start just before the deadline, creating a frenzy in the press box and the clubhouse. Setting the stage for the interesting day at the baseball stadium, however, is what’s going on the arena a few blocks away. Just weeks after the Trenton Devils folded, the beloved Trenton Titans have returned. Having covered the former for the past three seasons, it’s amazing how much people talked about the latter…and rightfully so. In their heyday, the Titans were the hottest ticket in town, packing the-then Sovereign Bank Arena on a nightly basis. They won the Kelly Cup in 2005, and shared an affiliation for much of their duration in the city with the Philadelphia Flyers, which was a perfect combination given the area’s strong fanbase of Philly fans. But, the New Jersey Devils came in and, as part of their impossibly failed “Paint The Town Red” campaign, purchased the Trenton hockey franchise and eventually re-named them the Trenton Devils. The Titans fanbase, admittedly already dwindling, was alienated and simply stopped coming. Players, while appreciative of the support they did get, derisively referred to the crowds as “The Green Seats Fan Club,” as they always played in front of sparse crowds and thousands of empty seats. There were times where no more than 100 people were in the stands at the drop of the puck, and it wasn’t as uncommon as announced attendance numbers would lead you to believe. Eventually realizing the disaster they’d created, the Devils pulled out of Trenton, folding the team and essentially killing hockey in the capital city. Or so everyone thought. As it turns out, talks were being held to bring back the Titans and just as importantly, bring them back as a Flyers affiliate. While everything came together very quickly and more details are sure to come out today, the fact is that the Titans are back. I’ll be covering the 1 PM press conference at the arena, to be held on the ice, and would encourage you to check out the blog I’ve had that’s chronicled professional hockey in Trenton since 2008-09…it will be renamed or shut down and replaced by a new one in the coming days, either or. So for me, this will be a fun day. And hopefully, I can make it fun for you too. So follow along, won’t you? See you at the rink…and the ballpark.